Derek Pruitt - dpruitt@poststar.com Seth McEachron and driver Tom Kline organize orders while working their milk delivery route through Northumberland from the Battenkill Valley Creamery in Salem on Wednesday morning. McEachron started doing home deliveries four weeks ago and is already looking to split his routes. He delivers milk, eggs, ice cream and other items he carries at the creamery in Salem. Derek Pruitt - dpruitt@poststar.com Jan King makes a milk and egg delivery on his route through Moreau from the King Brothers Dairy in Northumberland on Wednesday. The King brothers, Jan and Jeff, added home delivery to their dairy business a month ago, renewing a piece of the business their father and grandfather did in their dairying days. COURTESY PHOTO Edgar King, W. Edgar King and Greta King in a photo taken with their delivery truck at what was then called the Colebrook Dairy around 1960. 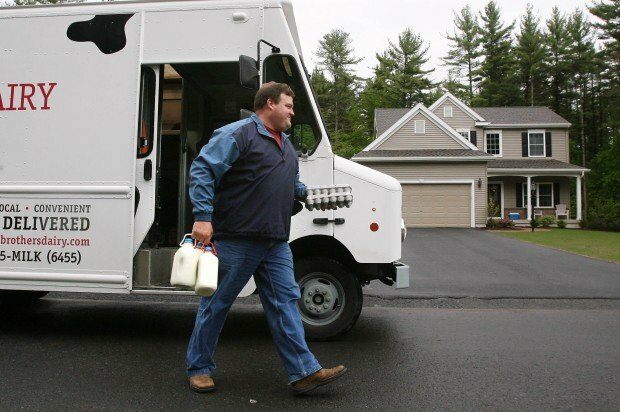 The farm, now operating under the name King Brothers Dairy, recently began delivering milk to homes again. Derek Pruitt - dpruitt@poststar.com Seth McEachron prepares for his home delivery route at Battenkill Valley Creamery in Salem Wednesday morning. McEachron started home delivery four weeks ago to further work his niche market for providing fresh, local grown and produced farm products. McEachron prefers to start his route early around 4 a.m. so he can get his product on customers' doorsteps before they leave for work. Derek Pruitt - dpruitt@poststar.com Seth McEachron stocks a cooler with ice cream for his morning delivery route from Battenkill Valley Creamery in Salem on Wednesday. McEachron started doing home deliveries four weeks ago and is already looking to divide his routes. He delivers milk, eggs, ice cream and other items he offers at the creamery storefront in Salem. Derek Pruitt - dpruitt@poststar.com Seth McEachron updates a PDA while running his milk delivery route from Battenkill Valley Creamery in Salem Wednesday morning. McEachron started doing home deliveries four weeks ago and is already looking to split his routes. He is experimenting with the PDA, which allows him to update orders on the run and print invoices on site. Derek Pruitt - dpruitt@poststar.com Seth McEachron makes a home delivery on his route through Northumberland from his Battenkill Valley Creamery in Salem on Wednesday morning. McEachron started doing home deliveries four weeks ago and is already looking to split his routes. He delivers milk, ice cream, eggs and other items that he carries at the creamery store in Salem. Derek Pruitt - dpruitt@poststar.com Milk and ice cream sit in a basket as Seth McEachron makes a home delivery on his route in Northumberland from the Battenkill Valley Creamery in Salem Wednesday morning. McEachron delivers milk, eggs, ice cream, maple syrup and is working to expand the offerings from what he handles at the creamery storefront in Salem. Derek Pruitt - dpruitt@poststar.com Jan King makes a milk delivery on his route through Northumberland not far from the King Brothers Dairy on Wednesday. The King brothers, Jan and Jeff, added home delivery to their dairy business a month ago, renewing a piece of the business their father and grandfather did in their dairying days. Edgar King remembers what it was like to deliver milk around Saratoga County as a young man growing up under his father's tutelage. He remembers how his father, too tall to fit into a traditional stand-up delivery vehicle, bought a surplus Army panel truck with a 4-foot by 8-foot bed, and painted the dairy's name on its front doors. 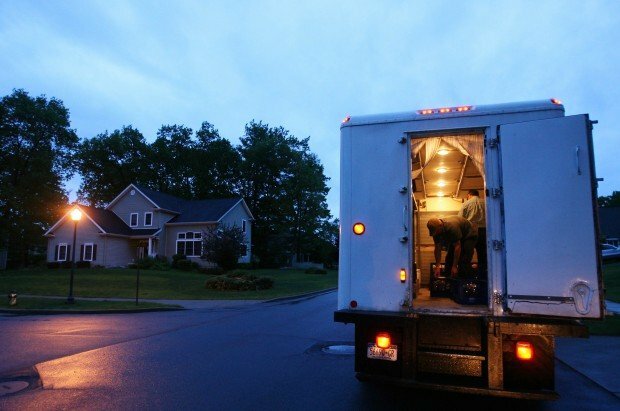 He remembers how, every other day, the truck was filled with cases of milk, 12 quarts to a case stacked three high and covered with 300 pounds of ice that was purchased in a block, broken up with an ice pick and covered with an insulated blanket. Most of all, he recalls what it was like to bring his family's product - creamy, whole milk from their Northumberland farm - to people's doorsteps, and how the job gave him unique access to their lives. Trusting customers would leave their doors open and ask him to leave the milk in the refrigerator. Observant Jewish residents would ask him to light their stoves so they wouldn't break the Sabbath. Old women would invite him inside for freshly baked blueberry muffins. Skeptical canines were won over. And, in at least one instance, his father's ripped pants were quickly mended by a customer handy with a needle and thread as his father stood behind a closed door out of modesty. "I wouldn't trade that experience in my life for anything," said King, who at 70 remains active at the family's dairy farm. "When you really get to know them, people are great. This is something that goes way beyond a cash-register experience. You really became a tiny piece of the fabric of your customers' lives." "Those people weren't just customers, they were friends." Supermarkets began to take over, though, and the business faded. The routes were curtailed and eventually discontinued. The last run was made in 1961, roughly three decades after King's father, also named Edgar, started to deliver milk in the area. Nearly a half-century later, King's sons, Jeff and Jan King, are back out on the road. After contemplating the idea for years, the brothers bought a truck capable of holding up to 400 gallons of milk, plastered the dairy's name on the side and started taking orders. The first run - through Wilton, Saratoga Springs and other surrounding communities - was made earlier this month. For Jan King, the return of the delivery service, complete with the refillable glass bottles, represents more than a new avenue to sell his farm's milk. It is, he says, a chance for the King Dairy Farm to "go back to its roots." "When I drove out on that first delivery, I was pulling out of the driveway and I just kind of had to smile to myself," he said last week from the farm's 800-cow operation in Northumberland. "I just thought, ‘Boy, isn't this great.' It really does give you a sense of pride." The King brothers aren't the only area dairy owners who have moved to directly market and deliver their milk. The Battenkill Valley Creamery, located in Salem, also began making runs through the Saratoga Springs area earlier this month. Seth McEachron, a fifth-generation farmer who runs a dairy farm with his father Donald, said the service is a logical addition to the business, which began to process and bottle some of its own milk in 2008, and to make its own ice cream last year. Customers, McEachron said, are interested because of the convenience and because they want to buy a local, fresh, quality product that they know is safe. Milk produced by each of the local dairies can go from udder to doorstep within a day. "It's a whole mindset now that it's good to get back to the natural, fresh local products and what better way than to get it direct from the farmer?" McEachron said Wednesday after making an eight-hour run through Saratoga County and delivering to 60 homes. Still, the 330-cow farm sells about 60 percent of its 19,000 gallons of milk each week to a cooperative on the wholesale market. The Kings, too, said the delivery service is a small portion of their overall business. McEachron and the Kings both say they believe the service will always be a niche, but they also believe their home-delivery routes will grow as their products become well-known in the community. The Kings added a second delivery day for the first time this week and McEachron said he will likely have do the same in the coming weeks. He recently bought a new delivery vehicle to keep up with the growing roster of homes taking milk, McEachron said. "I think we have room to grow and can pick up more customers, no question," McEachron said. "The thing is, once someone tries our milk, they don't go anywhere else ever again." The shift from wholesale to direct marketing helps the dairies because it allows them to avoid, to a degree, the volatile wholesale market. Prices offered through cooperatives fluctuate frequently, and have been particularly depressed in recent years. Selling milk directly to a consumer removes the middle man, allowing the farms to charge what they consider a fair price. Half gallons delivered to a doorstep by each of the local dairies are selling for $2.50 to $3.50, with special varieties likes chocolate costing more. "The last few years have put a major hurt on dairy operations," said Richard Smith, a financial counselor with the Saratoga County Cooperative Extension who works with dairy farmers. "So they're looking for ways to stop the bleeding and to heal and if they can get the retail price, that really helps." Delivering milk isn't as easy as buying a truck and some bottles. The milk has to be stored, pasteurized and inspected. The farmer has to be able to dedicate resources to the effort - money for the truck, time away from the farm and advertising - while handling all of the other aspects of running his business. "There are a lot of logistics involved," Jan King said. "It's not just a matter of putting out a sign and saying, ‘OK, we're selling milk now.'" The barriers to entry may deter other dairy farms from getting into the business, and that comes as good news to those who made an early entry into the market. Smith and the owners say they recognize their success is built largely on offering something unique, and that, if too many dairies deliver, their products will saturate the market, hurting prices and the bottom line. "It's going to be a good deal unless every farmer in the nation starts doing it," Smith said. "Right now, though, I think it's a wonderful window if a farm can make that commitment." I buy Battenville Creamery milk at Hannaford's and I hope their entrepreneurial efforts at home delivery is a great success. I'm jealous of those in their delivery area. Bravo Drew for good writing and bringing us some nice news. Great story... I love milk! :) Wish I lived near these farms, I would definitely join in! awesome good for you and the community. Thanks JimmyD!! I'm in for the egg delivery. Let's get some milk boxes back on the porch in QBY. If any local diary farmers are reading this, I only have 2 words. I can remember as a kid in the 60's, Ideal dairy farms delivered to our house in Glens Falls (and, in glass bottles! Should never drink out of plastic!). My brother Greg and I would stick our heads out of the upstairs window in the wee hours of the morning and ask the delivery guy to leave some chocolate milk. He would leave it and tell us to go back to bed! The good old days!! I thought those days were gone forever! Thank God there are people not afraid to try it again. I now live outside the village of Fort Ann, and would gladly take delivery from a local farm!! God bless America! I remember back in the early and mid 60's when we had milk delivered in the weee hours of the morning. If I look hard enough, I might still find the old milk box we had on the porch. The old milk box wasn't too well insulated, so in the winter, and before milk was homogenized, the milk and cream would often separate. It was a morning ritual in our family to guess how far above the top of the bottle the cream had risen. Sometimes 1/2 an inch, sometimes a lot more. Please consider delivering to Queensbury - we currently have eggs delivered to our door from Thomas Dairy and would love to have milk delivered as well! We love the local farms and their products! YAY! A warm news article! I ALSO REMEMBER THOSE DAYS AND WISH SOMEONE IN MY AREA DID THIS. I WOULD EVEN GO TO THE FARM AND BUY IT IF I KNEW OF ONE THAT SOLD MILK. I WAS RAISED ON A FARM AND RAISED ON FRESH MILK AND THERE IS NOTHING BETTER. GOOD FOR YOU AND GOD BLESS YOU FOR BRINGING A LITTLE BIT OF THE "AMERICAN WAY" BACK INTO MY LIFE. I WISH YOU ALL THE BEST. I'm only 25, so I've never gotten to experience milk/grocery delivery. But I have always seen it in the movies and thought, "wouldn't it be nice if we still had that." I think its an excellent idea.